My grades are due at 8 a.m. tomorrow. 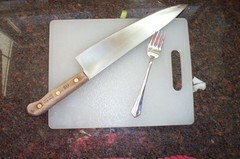 I'm in pretty good shape, especially for me, though I still have wood to chop, as Clark would say. 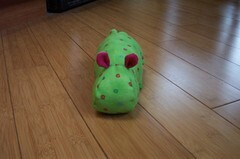 There's more than there might be because I got really tired of the whole exercise yesterday afternoon and made a hippo. but tacking those ears on this morning made me think she might actually make it. What's key for me at the moment, regardless of how she looks, is that as I was making her, I felt my brain untwist. And you know that can't be bad. Take care! Be kind to yourself -- don't twist your brain more than a quarter-turn today. 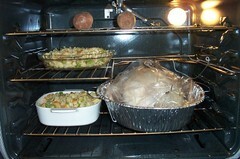 Clark and I cooked a big Thanksgiving meal, even though it was just us and Ellie. I liked the fact that there was no pressure -- even the nicest guests, like any of my various relatives or friends would have been, no doubt, would have made me nervous. I cooked this meal for seven adults four years ago, but my mom was there to tell me that the turkey was/was not done, that she was pretty sure I would not be poisoning anyone that day, etc. Now I think I could do it for others, with or without a guardian angel. I think. 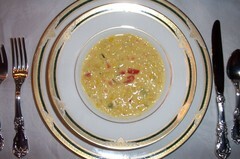 The Fabulous & Easy Newcomer Award goes to the Bon Appetit corn bisque recipe I turned up in an old issue on my shelf. 100 percent of adults in my household would eat it again, any chance they got. Halve the recipe and have at it! Thanksgiving was an amazing time when I was growing up. My mom really made it her own. Once we had 35 people for dinner -- and there was food enough for all, no disasters, no fights. 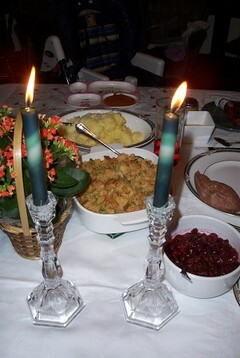 Not that my family are vocal, holiday fighters anyway, but Thanksgiving was always perfect in every way. I loved getting up the next morning, with the white linen tablecloth still in place, and eating a late breakfast of stuffing and pumpkin pie. One of my prized possessions is a copy my mom made for me of what came to be called The Blue Document, a couple of pages of notes she kept as a running tab on the number of guests, size of the turkey, etc., to which she added each year. You can see cousins grow from kids to adults, menu tweaking, though never very much, the little scribbles my youngest sister added as a toddler...it's torn, and I think it has some chicken-broth spots on it, and it's very, very precious. My mom is so unflappable in the kitchen, rolling out these delicious, totally complete meals without ever seeming to bat an eye. This is not one of my strengths. But with a lot of help from Clark, I got as close as I ever will, probably. This weekend was a great chance to start making Turkey Day a special time for my little gang. And I even have my own documents now, though there was no blue legal-pad paper ready to hand. Hope everyone had a great weekend! Now, to the news. 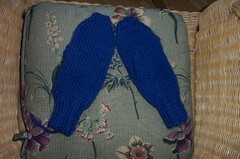 I finished the Mongolia mittens on Saturday. The yarn is Brown Sheep Lamb's Pride Bulky. I used size 9 needles to give a dense, wind-stopping fabric (I hope). I borrowed the cast-on number and the number of stitches for the thumb gusset from this nifty pattern. I also took the pattern's advice and began the decreases at the top of the hand when I reached the top knuckle on my middle finger, and that worked well. Yesterday, Clark, Ellie and I went for a walk, and they dropped me off at Arcadia, where I bought three skeins of natural-color Cascade 220. They're for a nice, warm cardigan for Ellie. The non-knitters went on to the park, and when I caught up with them I wound one of the skeins into a ball while watching them go down the slide and generally climb around. What happiness. 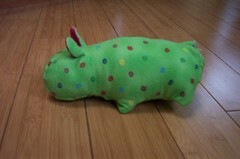 The original was made of fleece made from recycled soda bottles. As soon as I bought it, I found a site online that sold the same fleece, but I didn't buy any. This time around, I couldn't find it at all. I regret not buying it when I could have. 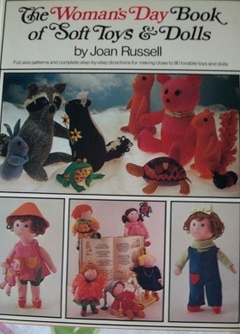 As written, the pattern is really easy and gives good results. 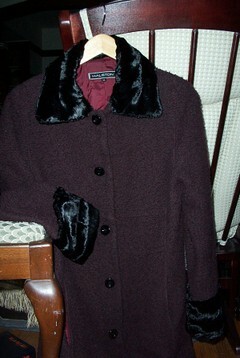 I decided the coat should have a lining, however, and that was a big pain. But it will certainly keep her warm and may even work for next winter, too. 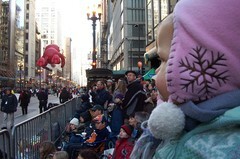 Well, I did have a lot of fun at the parade...for the first hour. The next 15 minutes, before I finally prevailed and we left, felt excruciatingly long to me. 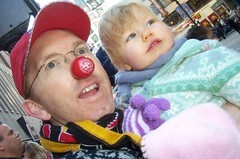 Clark and Ellie loved it all, though, and that made it more than worthwhile. 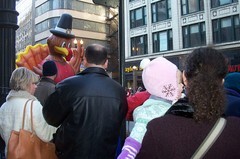 Starting if off right, with a Giant Turkey. Pilgrim-hats off, first to the geniuses long ago who ran the El under State Street, and next to the geniuses who put the parade on State Street! We popped up from the Jackson stop, found a great space half a block up, and popped back into the underground when we were ready to go. I think -- I hope -- that it's only in the area of parades where the risk of my misbehaving and getting cranky is greater than my toddler's. The bag that the pouch is now helping to organize hasn't been properly introduced. 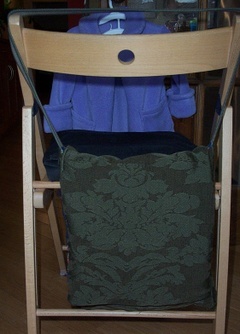 I guess it's Praise the Tutorials Week here at healthytension -- this bag comes to us courtesy of an excellent Craftster tutorial. I made it the morning of the Graknitti event. I thought more than once while making this that I would never carry it and would eventually cut it up into smaller somethings-or-other. The corners don't really line up at all -- who knew that it would hang straight and look pretty good anyway? I wonder if I'll remember the next time I do something with a big motif to center it on the individual pieces. Don't bet on it. 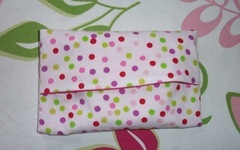 It has two interior pockets, one for my planner and one for my cell phone. The cell phone always falls out of its pocket, however, and thus has forfeited its right to live there. The wallet couldn't be happier. 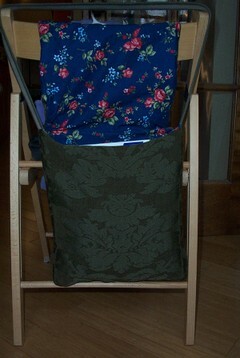 Sometimes when surfing sites with handmade bags for sale, I see fabric pairings that, for me, simply don't work. "But that's just me," I remind myself, and move along. I am now carrying a bag that might provoke a similar response in others. I now know one reason why Odd Fabric Pairings happen: remnants. Materials for the whole thing didn't total $10. 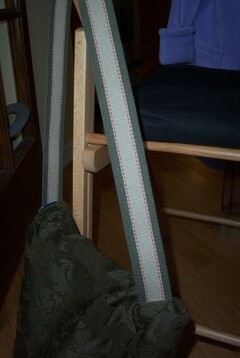 The exterior is upholstery fabric that I used wrong-side out. Remnants, my friends, remnants. You can't go wrong with remnants. Thank you for the compliments on the coat! Now if I could just get it to the dry cleaners to spiff it up a bit more. I gave the exam for my DePaul class on Thursday night, which meant that Wednesday was a bit hairy with preparing the exam and grading papers. 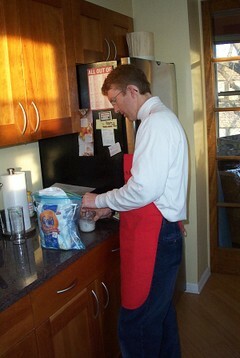 But, thanks to some timely babysitting from Cate, I actually was ready by mid-afternoon Thursday. Whoah!! I celebrated by making a little pouch to organize various things I carry in my bag. It took no time at all thanks to this great tutorial. Fabric from the stash, yes. 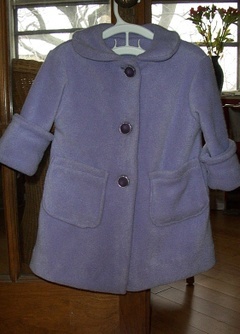 So, for about $30 $23 (hello, math whiz), I feel like my four-year-old coat is brand new. Plus, I keep nuzzling my cheek against my collar -- ahh, minky-velvetness -- and that's gotta be worth something. This was easy as pie, you know. If I can do something, anyone can. Seriously. I think that's one of the big reasons I blog about these non-knitting projects -- to say, "Look, if I could pull this off somewhat acceptably, you can do a dang fine job with it!" So get out there and hack your clothes! I only caught the last minute or so of it, but on today's Sesame Street re-run, Tony Bennett sang "Slimey to the Moon" (ad-heavy link, there) to footage of that small worm's historic trip, about which I was woefully ignorant until this afternoon. 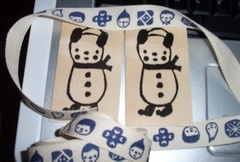 The panda and/or snowmen are gift tags made of very thin wood. And that's twill tape stamped with Sarah Neuburger's own designs. I'm so psyched to find fun uses for both! 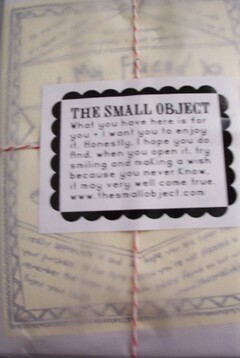 I also smiled on seeing the surprise extras that make buying from independent makers-of-things all the more pleasant, in this case stickers!, a sweet magnet, and a couple of very gracious bits of text to her customers. Thanks, Sarah! Such fun in the shopping, anticipating (which never lasts long -- they're all so quick) and receiving. I wish I could shop at independent-Internet crafters more often.